Crookedholm became the home of my Strachan great grandparents Joseph Strachan and Jeanie Haddow in around 1870, and is where my grandfather Henry Strachan was born, grew up, married and started a family. The main coal mine at Crookedholm was the Portland Colliery No. 4 Shaft known locally as the Wellington Pit. Portland Colliery appears on a list of mines active in 1869 and was owned by Allan Gilmour & Co, which was to became Portland Colliery Co. Allan Gilmour also owned mines at Hurlford and Kilmarnock and, via Boyd Gilmour & Co, had interests in the Goatfoot, Burnbank and Ladyton mines at Galston. There is a Gilmour/Strachan connection, as in 1846 Janet Ross Gilmour married Robert Strachan, son of Peter Strachan and Mary Monroe. Wellington Pit is where my great grandfather Joseph would have worked as a coal hewer when he moved to Crookedholm. It’s where my grandfather Henry would have started working as a miner at about the age of 14, as did his brothers Robert, John and Colin. Joseph’s younger brother Henry Strachan also lived and worked in Crookedholm and his sons Robert, William and Henry began work as coal miners there. 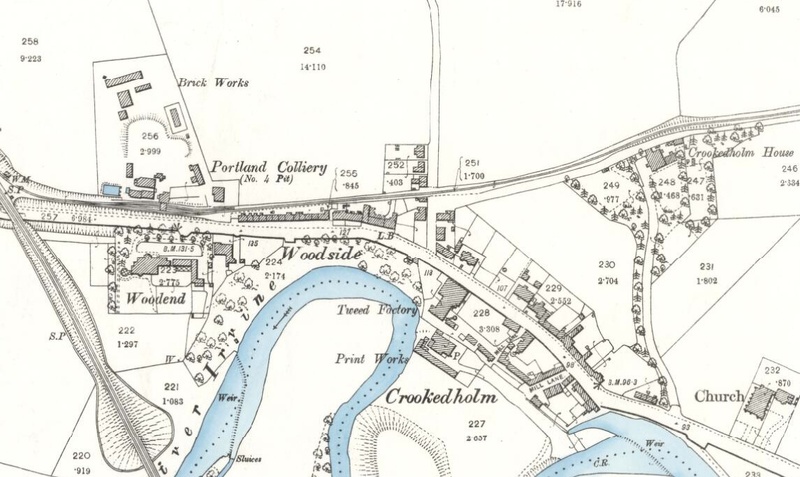 Crookedholm from a map surveyed in 1856. Cowans Row, where many a Strachan was to reside, is already there, next door to the coal pit: it’s the straight row of cottages on the main road where it says Woodside. 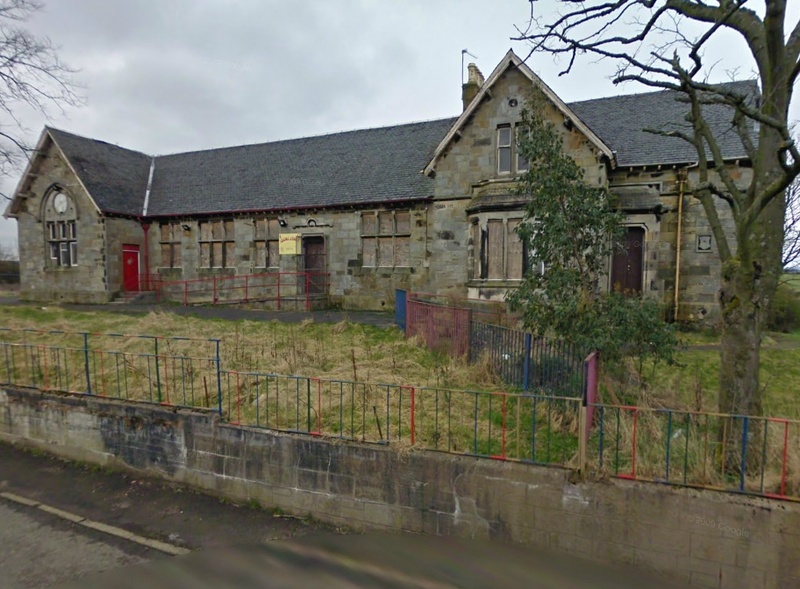 A school was built just outside Crookedholm in 1875, and is where Henry, his siblings and his cousins would have been educated. An Act of 1872 set up Scotland’s national system of schools run by local school boards and made education compulsory up to the age of 13, which rose to 14 in 1883. Crookedholm School built in 1875 and unused when Google filmed it, but it won’t be demolished as it is a listed building. If it hasn’t already, hopefully it will find a new owner soon. When it was built it had a integral house where the school master or mistress would have lived. No specific address is given in the census for where Joseph Strachan was living in Crookedholm until 1891, when the family are at Lamonts Land. In the 1895 Valuation Roll he’s listed as tenant of House 6, Crookedholm, owner Elizabeth Dunlop, and his death certificate in 1895 says he was at Dunlops Land. In 1901 his widow Jeanie is living on Schoolhouse Road, Crookedholm, which sounds as if it was the road leading to the school. 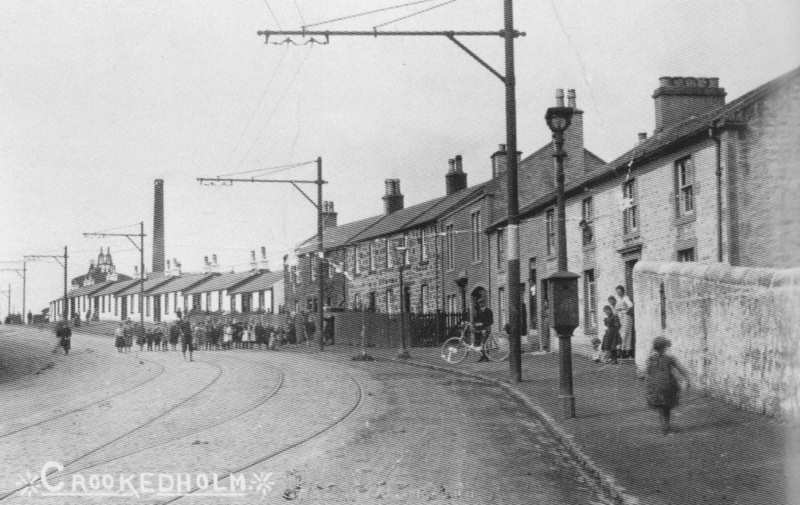 Crookedholm in 1896. The coal pit has expanded and a brick works has been built on the site. The road leading upwards (north) is the one that led to the school. In 1901 Joseph’s married son John Strachan was living in a house at Cowans Row. Joseph’s brother Henry Strachan and Henry’s son William Strachan were also both living in houses on Cowans Row. My grandparents Henry Strachan and Helen McCrae were at Old Factory House, but by 1905 they too had moved to Cowans Row. The tenant of the houses on Cowans Row was Portland Colliery Co, who sublet them to miners. A tramway was built in 1903 running from Kilmarnock Cross to Hurlford Cross, passing along the main road at Crookedholm. The photograph below appears to have been taken not long after the tramway was installed, and it shows Cowans Row on the left, with Wellington Pit immediately behind. Given the number of children and its date, it’s probable there are quite a few Strachans in this photo. The western part of Crookedholm, showing where several Strachan families lived in the early 1900s. All the buildings shown in this photo have now gone. The coal mine has gone too and is now just fields. Cowans Row and the old two storey buildings have all been demolished, replaced with single storey housing for elderly people, but it’s still called Cowans Row. 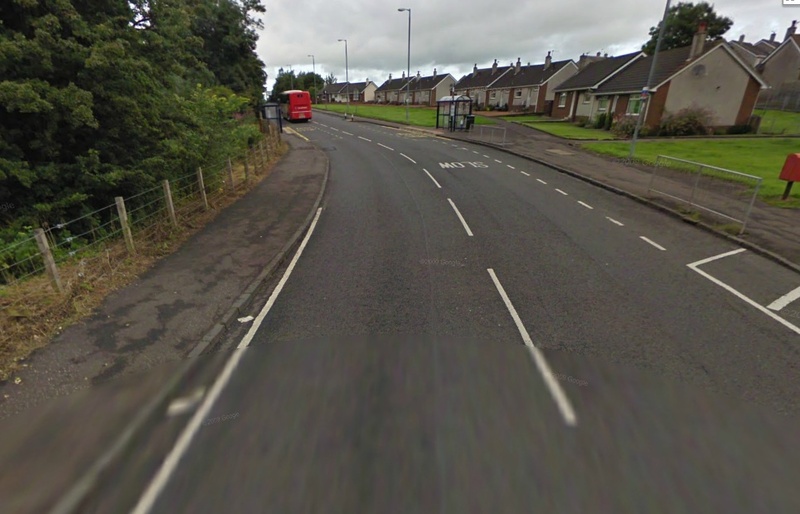 A screen shot from Google Street View showing the same view of Crookedholm today. The cottages that replaced the old miners’ row look uncannily like the old housing they replaced! Thank you so much Judy for this article. The pictures are great. I now can visualize where my grandfather lived as a boy. My father was born in Cowans row in 1915, he was William Black Strachan.his mother was Elizabeth and his father Henry, who worked at the Wellington pit..
Hi Fay. Your name sounds familiar – have we been in touch before? Glad to hear of another Strachan family in Cowan’s Row. We’re related, as we both go back to Robert Strachan born 1808 and his wife Margaret Haggerty. You’re descended from their son Henry, who married Elizabeth Black, and I’m descended from their son Joseph, who married Jeannie Haddow. Interesting that at times, in the census, your Henry is listed as Hendry. My grandfather (father’s father) was called Henry, but my father used to say that he was really named Hendry. He was most often called Harry, though. I really do not know too much about my fathers family, I thought my grandmothers maiden name was Cunningham, she came from Auchiinleck..
My brother is Henry Strachan, I have a cousin Henry. Who is known as Harry. Thank you for sending me this information Judy. Hi there, stumbled across this article, I currently stay in crookedholm, my ggrandparents and mum and dad all born and raised here, nice to find out some things I never knew about it, thanks. I lived in Hurlford from 1948 till 1965,and can remember all these places,written about.I didn’t realise how industrialised Crookedholm was. I can only remember Limmer and Trinidad tar factory,where the tweed mills on the Irvine were. Really interesting,where do you get these old maps? What a great read ! My grandad is Charles Calderwood born 29/09/1909 Crookedholm he married Elizabeth Campbell, I believe he worked in this mine. I’m struggling with this side of my family tree if you have anything you could pass on it would be much appreciated. Hi Judy, I am researching my wife’s family tree of William Stowe and noted from his marriage cert. 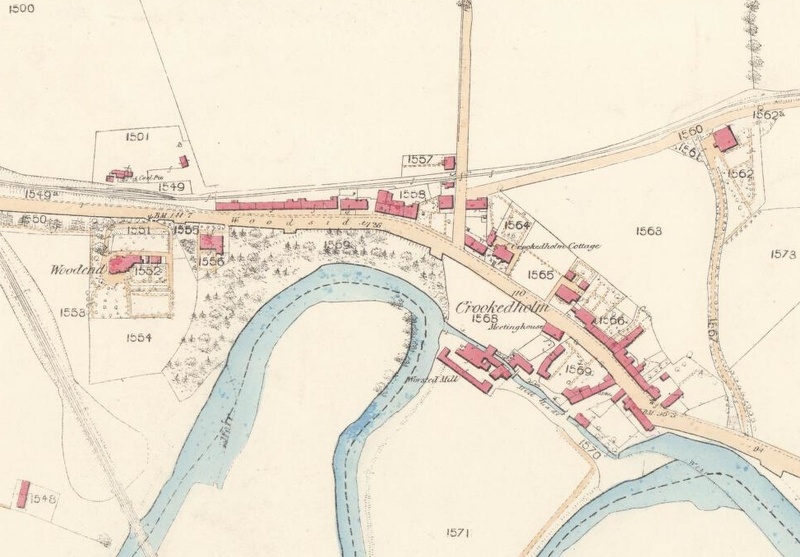 1882 usual address was Dunlops Land, Crookedholm. Punched this into the Internet and up came your site. Checking on the 1885 Valuation Rolls I see that William Stowe lived at no 223, Henry Strachan at 222, next door, and Joseph Strachan at 209, a small world. In 1871 William Stowe was at no 3 Soulis Street, having recently arrived from Ireland. No doubt he was working in the same pit before offered housing on Dunlop’s Land. They later moved to Black Braes, Muiravonside.Thanks for all the great reading and pics. Shillitoge@gmail.com (a Fellow tyke Sheffield b1941) Now long since retired at Sutton Coldfield. Thanks again.